Please do not waste your time comparing items that are completely different. Lot 57 is a stem cup, yours is a censer. And Lot 57 looks as it was painted by a child or amateur, not a professional porcelain painter. I have also to tell you that this one as the one above, Lot 56, are very low quality fakes. The people who made these had no idea how Chinese porcelain painting techniques look. Please be careful, small auctions sell lots of fakes. lot no. 57 and my pictures here is small here is the link to the bowl or censor please click below and let me know what you think. thanks. 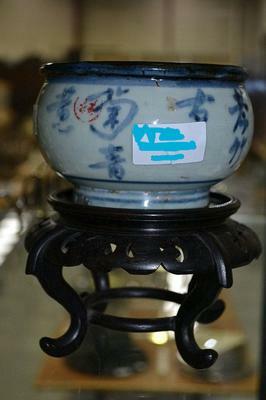 Please do not mis-comment me...I said there was NO blue and white porcelain in the Tang dynasty. And, this could impossibly be from the Yuan dynasty either. I wouldn't waste time in trying to establish that sort of link. With porcelain deeper knowledge is required to even merely recognize genuine items from those periods. Basic things as shape, white glaze and blue color of this are all not right for that period, I'm afraid. I couldn't tell much with a single picture. All I can say now is that there was no blue and white, and no porcelain in our sense, existing in the Tang dynasty. At the very best this could be Qing dynasty or republic period, but without more pictures it could as well be new.